Will Obama suffer from the 'Bradley effect'? (CNN) -- Sen. Barack Obama has a sizable lead over Sen. John McCain, polls show, but those numbers could be deceiving if the "Bradley effect" comes into play. Polls show that Sen. Barack Obama has a sizable lead over Sen. John McCain. The Bradley effect is named after former Los Angeles Mayor Tom Bradley, an African-American who ran for California governor in 1982. Exit polls showed Bradley leading by a wide margin, and the Democrat thought it would be an early election night. But Bradley and the polls were wrong. He lost to Republican George Deukmejian. The theory was that polling was wrong because some voters, who did not want to appear bigoted, said they voted for Bradley even though they did not. "People will usually tell you how they voted after the election, but we found in the Bradley campaign ... that people were actually not telling us who they voted for," said Charles Henry, who researched Bradley's election. 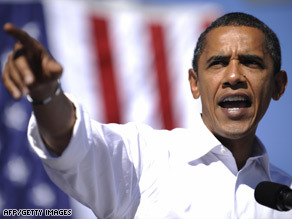 According to CNN's latest poll of polls, Obama is leading McCain by 8 percentage points, 50 to 42. Will 'intellectual' label hurt Obama? "It leaves a question mark over this race, and we won't have the final answer until the votes are counted," said David Gergen, a senior political analyst for CNN. But there could be an opposite effect, Wilder said. "There's going to be a reverse Wilder or Bradley effect. ... There are some Republicans who are not going to say out front that they're going to be voting for Obama, but they're going to be, because the economy is what's driving people to consider what's in their best interest," he said. Some analysts say the Bradley effect can account for 6 percentage points against an African-American candidate. Michelle Obama told CNN's Larry King that a lot has changed since Bradley lost. "That was several decades ago, and I think there's been growth and movement," she said. "I just believe that the issues are going to weigh in people's hearts more so as they go into the voting booths this time around." Former San Francisco Mayor Willie Brown said last week that he thinks the Bradley effect could cost Obama several battleground states -- and possibly the presidency. Race "is still a problem in this country," Brown told CNN. "It goes away when there are other troubles that are more challenging, and right now, whether or not we survive in the economy is more challenging. But race could rear its ugly head. I just hope it doesn't before November 4." In the past 15 years or so, there's been no indication in the polls that the Bradley effect has been a factor in statewide races. "We've never had a black presidential candidate as a major nominee, so the polls don't have any history at all when it comes to national elections," he said.